I picked up this awesome fabric at the East Bay Depot for Creative Reuse in Oakland awhile back and I knew it needed to be made into a dress. I think it was a color test sample for a printing company, as there were a bunch of fabric banners in the bin too. I was looking for a design that had minimal pieces to preserve as much of the color swatch pattern but still give some shape. I don't have too many patterns in my vintage collection, I've pared down a lot since moving, but this one seemed like it would do the trick. 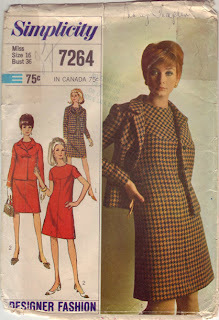 While the lovely model on the pattern cover makes the dress appear form fitting, once I made mine the a-line was a little loose around the waist. I guess I have more hips than the model, so I added some waist darts in the front and back to bring it in a little more. 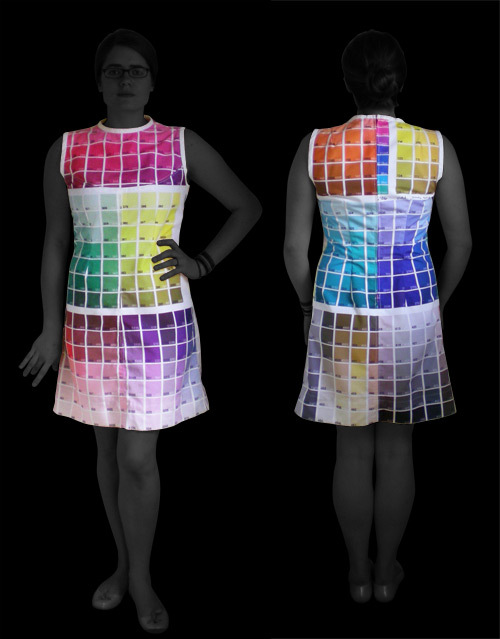 I love wearing this dress because it removes any need to make a decision of what color to wear, I get to wear them all.